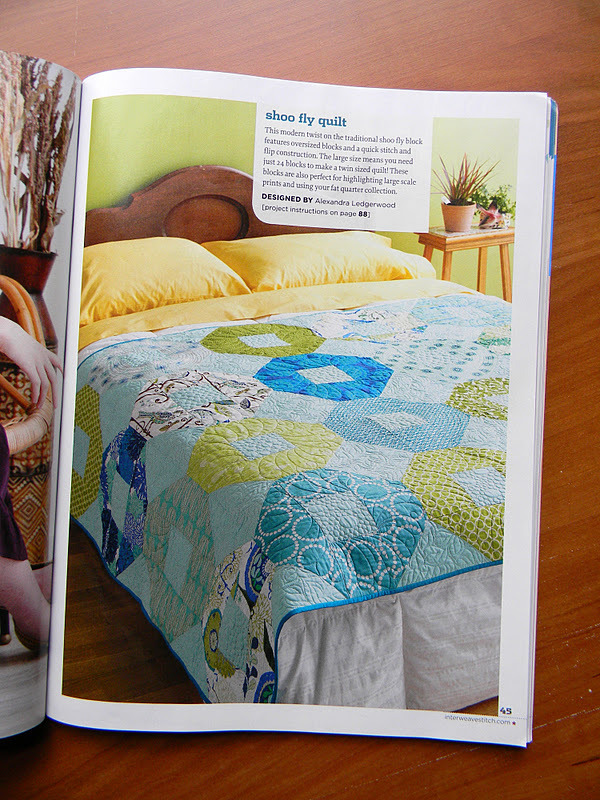 Today I get to share a big first for me - my first quilt pattern published in a print magazine. 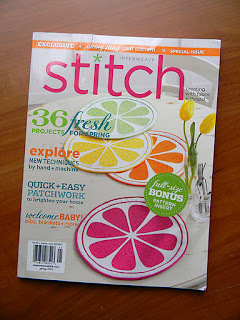 My quilt appears in Stitch, Spring 2012. It is very cool to see it in print, as I haven't seen it since I mailed it away in August. When I get the quilt back, I'll take lots of photos to show you the incredible quilting Angela did on it. I'm sorry to see that the magazine seems to have overlooked giving her credit as the quilter, but anyone who sees this quilt will know someone amazing worked on it. More pics to illustrate that soon. You may remember this shoo fly quilt design from my shoo fly blocks using Good Folks fabric. This one is in my WIP pile awaiting my attention. Now that you've seen it in two different color ways, I hope you're thinking of how it might look in your own fabrics. This modified shoo fly block uses stitch and flip corners to reduce the number of pieces and seams in each block. If you choose, you can create HSTs from the trimmed corners and make a baby quilt with them, like I did. 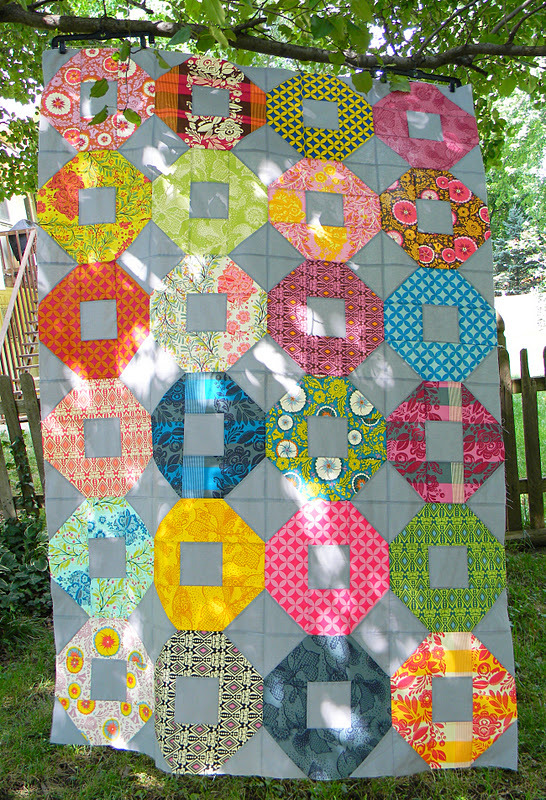 This block is oversize, so it's great for fat quarters and larger scale prints. The quilt finishes at 60 x 90. I'd love to see what you make from the pattern. Update: This pattern is now available as an individual pattern download, and it's on sale! I wish this magazine was available here in the UK! That's fantastic! Good for you. Now I know what you meant by "extremely" famous. LOL! This is so fabulous, congratulations!!! The first of many, I'm sure. Oh my gosh! That's you! I saw that as I was flipping through my copy last night. The colour is what stopped me. I adore the combination you used. Way to go!!! That's awesome! Congrats, it look good! I was just flipping through that magazine at the fabric store the other day, It look like a good edition! How fantastic for you! Congratulations. That is a beautiful quilt. Congrats! I like how they photographed it too. Quilts look so pretty on a bed. Way to go, Alex - I am so excited for you! hey! congrats! that is so great! Spent time with my daughter today & she was SO excited to have picked up the current STITCH - and guess what quilt she wants to make!? Very fun! You must be so excited! Congratulations! Congratulations! 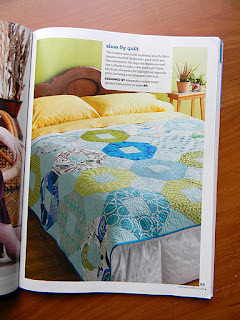 Your gorgeous quilt is my favorite project in the whole magazine!! I'm brand new to quilting but I plan to tackle it over the next few months anyway!! :) Thank you for the inspiration!! Your quilt is wonderful! Congratulations and enjoy the ride! Oh that quilt is so fabulous! Good Folks is one of my very very very favorite fabric collections. And that shoo fly block really shows it off. Have you quilted it yet? It will be AWESOME I am sure.